Welcome Home Series<sup></sup> handlesets are the perfect addition to your front door to create a unique and fashionable entryway to your home. Each is stylishly designed to provide maximum-security protection. There are many styles, finishes and configurations from which to choose. Round Pocket Door Lock The Antique Nickel finish offers a warm feel to the products style. This door pin is constructed from case-hardened steel and comes plated in chrome. The pin locks into the retaining ring when engaged and stores in the holder when unlocked. It securely locks your door is a closed or ventilating position and prevent the sliding or lifting of your door. This privacy door lock is constructed of solid steel and comes in a satin nickel finish. It features a surface-mounted, flip-action design to lock and unlock, with an anti-lockout mechanism making it safe for use in households with small children. This flip door lock includes all installation fasteners and it requires no mortising. This door lock is reversible and can be used on left or right-handed swing-in doors. This door lock is designed for use as a privacy lock on interior doors only and should not be used as a security locking device on entry/exterior doors. 1030 Round Antique Nickel Pocket Door Passage Lock Welcome Home Series<sup></sup> handlesets are the perfect addition to your front door to create a unique and fashionable entryway to your home. Each is stylishly designed to provide maximum-security protection. There are many styles, finishes and configurations from which to choose. 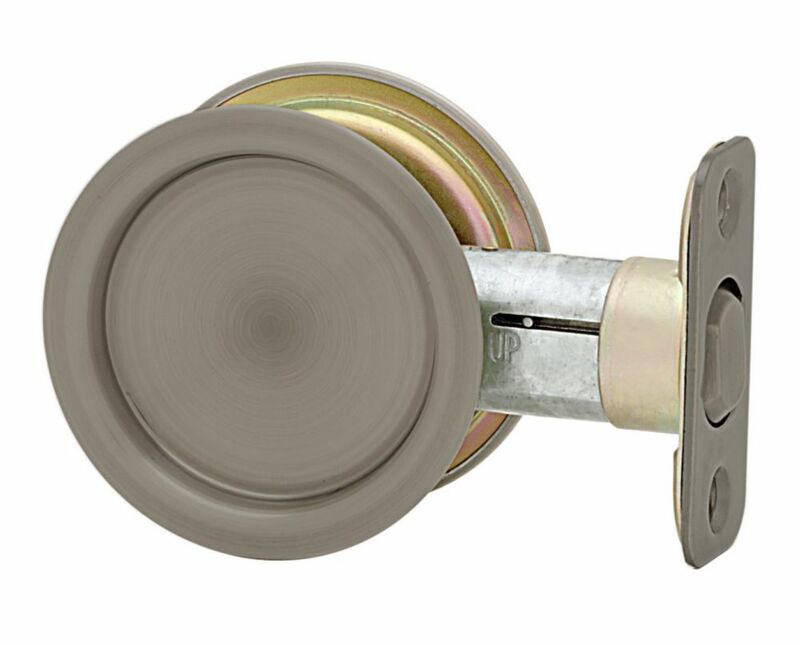 Round Pocket Door Lock The Antique Nickel finish offers a warm feel to the products style.